Document, Distribute & Profit From Your Knowledge. Great content has the power to change people's lives, and it starts with you! We'll never share your email with anyone else. It's promise. Meribook allows you to document your knowledge in a clean & super simple flow. Your content can never be buried multiple levels and is super fast to retrieve when you need it the most. Book » Chapter » Sections format. Tags allow you to organize your book, chapters & section to meet your needs, and built-in follow-up to get things done. Include YouTube or Vimeo embed without any restriction on layout and formatting. Full-text editor to format content and highlight the important parts as you please. Watch video. It takes less than 60sec. With Meribook, your content is organized in simple and intuitive format, it‘s secure and with a simple embed code you can promote in no time. 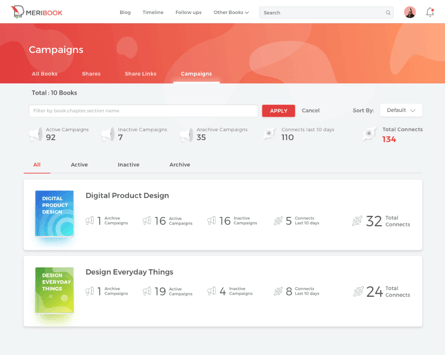 Meribook Connect speeds up your content marketing process as you don’t have to worry about converting your content into PDF, designing your PDF or figuring out how to deliver your PDF. Meribook Connect allows for content distribution from the very tool you use to document. 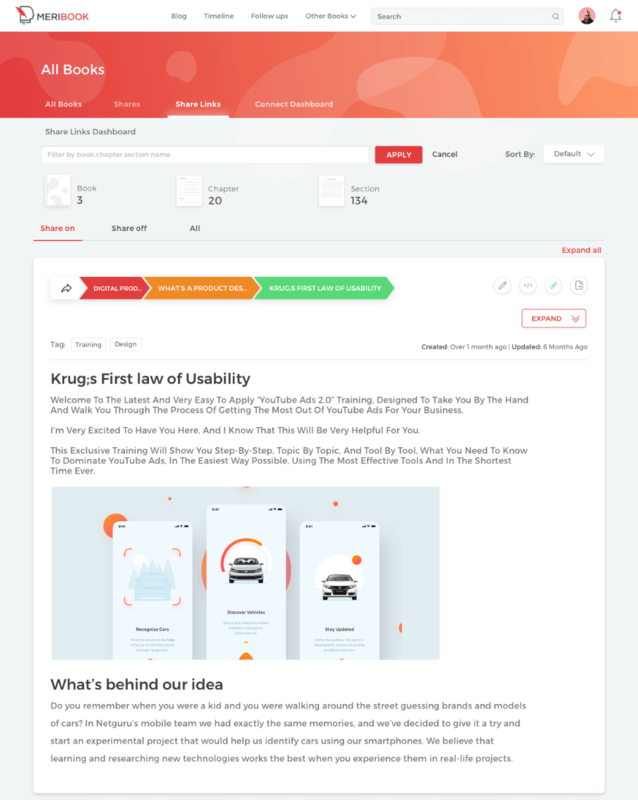 This speeds up your process as you don't have to worry about converting your content into PDF, design content layout and the tech needed for distribution. With Meribook Connect it's a simple embed code and you are done. Meribook's streamlines the note-taking and collaboration process to improve productivity and your bottom line. With a feature-rich text editor and simple chapters and sections concept, you can start documenting and organizing in less than 5 minutes. With fine-grained control over your content, you can share just what you want, how you want, and with whom you want with ease. Knowledge is wealth! Connect and share your knowledge with your tribe with our built in list building functionality. Meribook is a web-based solution and currently, there are no Apps for iOS or Android. It is ideal for desktop usage when entering content to use the WYSIWYG editor for image embed and formatting. The site is fully mobile responsive so accessing your data from any device is easy as long as you have an internet connection. Are there any limits when inviting a user to access my book? Free accounts have a three book limit on creating their own book and collaborating on books. All others, there are no limits on the number of people you can invite to work and collaborate with you. We believe knowledge is best when shared with like-minded individuals. What are the ways to collaborate? Meribook has three distinct ways to share your content. 1) Invite - Here you need to know the email of the person to send an invitation and then give permission to view, edit or manage. 2) Share Links - You can create a shareable link with very granular view permissions. For example, you can share only a section or only certain chapters or the whole book. Anyone with access to the Share Link can view the content. 3) Meribook Connect - Think of this as your lead magnet, free e-book distribution platform, the user get to see your most up-to-date content always. Are there any limits of Meribook Connect? Meribook Connect subscription allows you to run unlimited campaigns with no contact limits. Even our integrations are unlimited! For example, you can connect separate Mailchimp account to each book. Need to contact us? Chat with us or send us an email.